Not to be confused with comune. For other uses, see Commune (disambiguation). A commune (the French word appearing in the 12th century from Medieval Latin communia, meaning a large gathering of people sharing a common life; from Latin communis, things held in common) is an intentional community of people living together, sharing common interests, often having common values and beliefs, as well as shared property, possessions, resources, and, in some communes, work and income and assets. In addition to the communal economy, consensus decision-making, non-hierarchical structures and ecological living have become important core principles for many communes. Andrew Jacobs of The New York Times wrote that, contrary to popular misconceptions, "most communes of the '90s are not free-love refuges for flower children, but well-ordered, financially solvent cooperatives where pragmatics, not psychedelics, rule the day." There are many contemporary intentional communities all over the world, a list of which can be found at the Fellowship for Intentional Community (FIC). For the usually larger-scale, political entities in communist political theory, see socialist communes, which are similar but distinct social organizations. Of course, many communal ventures encompass more than one of these categorizations. Some communes, such as the ashrams of the Vedanta Society or the Theosophical commune Lomaland, formed around spiritual leaders, while others formed around political ideologies. For others, the "glue" is simply the desire for a more shared, sociable lifestyle. Moreover, some people find it is more economical to live communally. The central characteristics of communes, or core principles that define communes, have been expressed in various forms over the years. Before 1840 such communities were known as "communist and socialist settlements"; by 1860, they were also called "communitarian" and by around 1920 the term "intentional community" had been added to the vernacular of some theorists. At the start of the 1970s, "The New Communes" author Ron E. Roberts classified communes as a subclass of a larger category of Utopias. He listed three main characteristics. Communes of this period tended to develop their own characteristics of theory though, so while many strived for variously expressed forms of egalitarianism Roberts' list should never be read as typical. Additionally, the items listed by Roberts were the subject of general pop-theory discourse before and during his time and rather than being particular to communes indicate a wider international political discussion about post industrial societal structures and order. Roberts' three listed items were: first, egalitarianism – that communes specifically rejected hierarchy or graduations of social status as being necessary to social order. Second, human scale – that members of some communes saw the scale of society as it was then organised as being too industrialized (or factory sized) and therefore unsympathetic to human dimensions. And third, that communes were consciously anti-bureaucratic. Twenty five years later, Dr. Bill Metcalf, in his edited book "Shared Visions, Shared Lives" defined communes as having the following core principles: the importance of the group as opposed to the nuclear family unit, a "common purse", a collective household, group decision making in general and intimate affairs. Sharing everyday life and facilities, a commune is an idealized form of family, being a new sort of "primary group" (generally with fewer than 20 people although again there are outstanding examples of much larger communes or communes that experienced episodes with much larger populations). Commune members have emotional bonds to the whole group rather than to any sub-group, and the commune is experienced with emotions which go beyond just social collectivity. 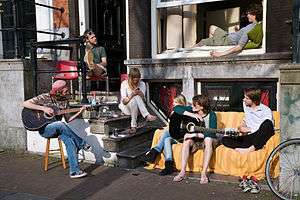 With the simple definition of a commune as an intentional community with 100% income sharing, the online directory of the Fellowship for Intentional Community (FIC) lists 186 communes worldwide (17 August 2011). Some of these are religious institutions such as abbeys and monasteries. Others are based in anthroposophic philosophy, including Camphill villages that provide support for the education, employment, and daily lives of adults and children with developmental disabilities, mental health problems or other special needs. Many communes are part of the New Age movement. Many cultures naturally practice communal or tribal living, and would not designate their way of life as a planned 'commune' per se, though their living situation may have many characteristics of a commune. In Germany, a large number of the intentional communities define themselves as communes and there is a network of political communes called "Kommuja" with about 30 member groups (May 2009). Germany has a long tradition of intentional communities going back to the groups inspired by the principles of Lebensreform in the 19th century. Later, about 100 intentional communities were started in the Weimar Republic after World War I, many had a communal economy. In the 1960s, there was a resurgence of communities calling themselves communes, starting with the Kommune 1 in Berlin, followed by Kommune 2 (also Berlin) and Kommune 3 in Wolfsburg. Have low ecological footprints through sharing and saving resources. Kibbutzim in Israel, (sing., kibbutz) are examples of officially organized communes, the first of which were based on agriculture. Today, there are dozens of urban communes growing in the cities of Israel, often called urban kibbutzim. The urban kibbutzim are smaller and more anarchist. Most of the urban communes in Israel emphasize social change, education, and local involvement in the cities where they live. Some of the urban communes have members who are graduates of zionist-socialist youth movements, like HaNoar HaOved VeHaLomed, HaMahanot HaOlim and Hashomer Hatsair. In 1831 John Vandeleur (a landlord) established a commune on his Ralahine Estate at Newmarket-on-Fergus, Co. Clare. Vandeleur asked Edward Thomas Craig, an English socialist, to formulate rules and regulations for the commune. It was set up with a population of 22 adult single men, 7 married men and their 7 wives, 5 single women, 4 orphan boys and 5 children under the age of 9 years. No money was employed, only credit notes which could be used in the commune shop. All occupants were committed to a life with no alcohol, tobacco, snuff or gambling. All were required to work for 12 hours a day during the summer and from dawn to dusk in winter. The social experiment prospered for a time and 29 new members joined. However, in 1833 the experiment collapsed due to the gambling debts of John Vandeleur. The members of the commune met for the last time on 23 November 1833 and placed on record a declaration of “the contentment, peace and happiness they had experienced for two years under the arrangements introduced by Mr. Vandeleur and Mr. Craig and which through no fault of the Association was now at an end”. In imperial Russia, the vast majority of Russian peasants held their land in communal ownership within a mir community, which acted as a village government and a cooperative. The very widespread and influential pre-Soviet Russian tradition of Monastic communities of both sexes could also be considered a form of communal living. After the end of Communism in Russia monastic communities have again become more common, populous and, to a lesser degree, more influential in Russian society. A nineteenth century advocate and practitioner of communal living was the utopian socialist John Goodwyn Barmby, who founded a Communist Church before becoming a Unitarian minister. The UK today has several communes or intentional communities, increasing since the New Towns Act 1946 to recuperate a lost sense of community at the centralization of population in Post-War New Towns such as Crawley or Corby. The Simon Community in London is an example of social cooperation, made to ease homelessness within London. It provides food and religion and is staffed by homeless people and volunteers. Mildly nomadic, they run street "cafés" which distribute food to their known members and to the general public. In Glandwr, near Crymych, Pembrokeshire, a co-op called Lammas Ecovillage focuses on planning and sustainable development. Granted planning permission by the Welsh Government in 2009, it has since created 9 holdings and is a central communal hub for its community. In Scotland, the Findhorn Foundation founded by Peter and Eileen Caddy and Dorothy Maclean in 1962 is prominent for its educational centre and experimental architectural community project based at The Park, in Moray, Scotland, near the village of Findhorn. The Findhorn Ecovillage community at The Park, Findhorn, a village in Moray, Scotland, and at Cluny Hill in Forres, now houses more than 400 people. Although communes are most frequently associated with the hippie movement—the "back-to-the-land" ventures of the 1960s and 1970s—there is a long history of communes in America (see this short discussion of Utopian communities). Andrew Jacobs of The New York Times wrote that "after decades of contraction, the American commune movement has been expanding since the mid-1990s, spurred by the growth of settlements that seek to marry the utopian-minded commune of the 1960s with the American predilection for privacy and capital appreciation." (See Intentional community). The Fellowship for Intentional Community (FIC) is the best source for listings of and more information about communes in the United States. As of 2010, the Venezuelan state has initiated the construction of almost 200 "socialist communes" which are billed as autonomous and independent from the government. The communes have their own "productive gardens” that grow their own vegetables as a method of self-supply. The communes also make independent decisions in regards to administration and the use of funding. The idea has been denounced as an attempt to undermine elected local governments, since the central government could shift its funding away from these in favor of communes, which are overseen by the federal Ministry of Communes and Social Protection. In Vietnam, commune (xã) is the lowest subdivision. It is a subdivision of a district-level town (thị xã), rural district (huyện) or provincial city (thành phố trực thuộc tỉnh). The Hutterites, named for their founder Jakob Hutter, live in a Christian "community of goods" and practice absolute pacifism, which has resulted in hundreds of years of diaspora to many countries. The Shakers, a religious sect, maintained one of the longest and most successful experiments in communal living in the United States. It was founded by Mother Ann Lee in Manchester, England. She and a group of followers settled in Watervliet, New York in 1776. By the mid-19th century, the sect grew to over 6,000 members living in 18 major communities, as well as six shorter lived ones. Although their numbers began a steady decline after the Civil War, one Shaker community remains active today in Sabbath Day Lake, Maine. The Harmony Society started by Johann Georg Rapp in Harmony, Pennsylvania, in 1804 and dissolving around 1905 in Ambridge, Pennsylvania, was one of the longest-running financially successful communes in American history. Brook Farm in Massachusetts existed from 1841 to 1847. Nathaniel Hawthorne, one of the commune's founders, fictionalized his experience in the novel The Blithedale Romance (1852). Fruitlands was a commune founded in 1843 by Amos Bronson Alcott in Harvard, Massachusetts. The tempo of life in this Transcendentalist community is recorded by Alcott's daughter, Louisa May Alcott, in her piece "Transcendental Wild Oats." The Oneida Community was a commune that lasted from 1848 to 1881 in Oneida, New York. Although this utopian experiment is better known today for its manufacture of Oneida silverware, it was one of the longest-running communes in American history. The Socialist commune, Modern Times, founded by the individual anarchists Josiah Warren and Stephen Pearl Andrews, was formed in 1851 in Long Island. It existed until 1864, when its name was changed to Brentwood. The Amana Colonies were communal settlements in Iowa which lasted from 1855 to 1932. The anarchist Home Colony was formed in 1895 across the Puget Sound from Tacoma, Washington on Key Peninsula, and lasted until 1919. The Twin Oaks Community is a commune was founded in Louisa County, Virginia in 1967; it continues to thrive. The Farm, founded in San Francisco, CA in 1971 by Stephen Gaskin, moved to Lewis County, TN about fifty miles south of Nashville. It is on-going and continues to make a significant contribution to intentional communities. Ganas is an ongoing commune in the New Brighton neighborhood of Staten Island, New York. The Latin Settlements were founded by German freethinkers who immigrated to the United States in the 1840s to mostly rural, south central Texas in the mid-19th century. The Cecilia Community in Brazil, an anarchist community founded by Italian immigrants around the start of the 20th century in the southern region of Brazil. The Brotherhood of the Spirit/Renaissance Community, created by Michael Metelica in 1968 and lasting until 1988, was the largest commune in the northeast United States. Jesus People USA (JPUSA), started in 1972 and based in the Uptown, Chicago, IL area, is perhaps the largest urban commune in the United States, and is still strongly flavored by its hippie / 60s roots. Kalakuta Republic (Nigeria), a modern manifestation of Nigeria's traditionally tribal urbanization, was the name the musician and political activist Fela Kuti gave to the communal compound that housed his family, band members, and recording studio. The compound burned to the ground in 1977 after a violent assault by a thousand armed soldiers in the service of the Nigerian state. Hutterite, a Christian sect that lives in communal "colonies"
↑ Jacobs, Andrew (1998-11-29). "Yes, It's a Commune. Yes, It's on Staten Island.". The New York Times. The New York Times Company. p. 1. Retrieved 2009-07-21. 1 2 "Welcome to the Intentional Communities Directory". directory.ic.org. Retrieved 28 September 2010. ↑ Zablocki, Benjamin (1971). The Joyful Community: An Account of the Bruderhof: A Communal Movement Now in Its Third Generation. Chicago: University of Chicago Press. ISBN 0-226-97749-8. ↑ Stockwell, Foster (1998). Encyclopedia of American Communes. ↑ "Kommuja-Netzwerk" (in German). kommuja.de. Retrieved 28 September 2010. ↑ Voß 1996, pp. 17–26. ↑ Trahair, R.C.S (1999). Utopias and Utopians: An Historical Dictionary. Westport: Greenwood Press. pp. 27–28. ISBN 0-313-29465-8. ↑ "Lammas". Lammas. 2014-03-21. Retrieved 2014-03-21. The Lammas project has been created to pioneer an alternative model for living on the land. It empowers people to explore what it is to live a low-impact lifestyle. It demonstrates that alternatives are possible here and now. ↑ "Findhorn Foundation – Findhorn Foundation History". Findhorn Foundation. 2014-03-21. Retrieved 2014-03-21. The Findhorn Community was begun in 1962 by Peter and Eileen Caddy and Dorothy Maclean. ↑ Local relations between the Findhorn Foundation and the village of Findhorn have occasionally foundered over inconsiderate use of the word 'Findhorn' to mean either the former or the Ecovillage. See for example Walker (1994), Talk:Findhorn Foundation and also Findhorn (disambiguation). ↑ Kanter, Rosabeth Moss (January 1, 1972). Commitment and Community: Communes and Utopias in Sociological Perspective. Harvard University Press. p. 32. ISBN 978-0-674-14576-4. Retrieved March 14, 2014. ↑ Jacobs, Andrew (2006-06-11). "Extreme Makeover, Commune Edition". The New York Times. The New York Times Company. p. 1. Retrieved 2009-07-21. ↑ Tamara Pearson. "184 Communes Currently in Formation in Venezuela". venezuelanalysis.com. Retrieved 28 September 2010. ↑ "Commune-ism: Yet another method to entrench the president's power". The Economist. 2010-07-17. Curl, John (2009) For All The People: Uncovering the Hidden History of Cooperation, Cooperative Movements, and Communalism in America, PM Press. ISBN 978-1-60486-072-6. Fitzgerald, George R. (1971). Communes Their Goals, Hopes, Problems. New York: Paulist Press. Hall, John R. (1978). The Ways Out: Utopian Communal Groups in an Age of Babylon. London: Routledge & Kegan Paul. Horrox, James. (2009). 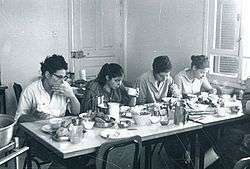 A Living Revolution: Anarchism in the Kibbutz Movement. Oakland: AK Press. Margaret Hollenbach. (2004)Lost and Found: My Life in a Group Marriage Commune. University of New Mexico Press, ISBN 0-8263-3463-6. Roberts, Ron E. (1971). The new communes: coming together in America. Prentice-Hall. Lauber, John. (1963, June). Hawthorne’s Shaker Tales [Electronic version]. Nineteenth-Century Fiction, Vol. 18, 82–86. Metcalf, Bill; Metcalf, William James (1996). Shared visions, shared lives: communal living around the globe. Scotland: Findhorn Press. ISBN 1-899171-01-0. Miller, Timothy. (1997) "Assault on Eden: A Memoir of Communal Life in the Early '70s", Utopian Studies, Vol. 8, 1997. Roberts, Ron E. (1971). The New Communes Coming Together in America. New Jersey: Prentice Hall inc.
Van Deusen, David. (2008) Green Mountain Communes: The Making of a Peoples’ Vermont, Catamount Tavern News Service. Voß, Elisabeth (1996). "Was ist eine Kommune?". Das KommuneBuch (in German). Göttingen: Verlag Die Werkstatt. ISBN 3-89533-162-7. Wild, Paul H. (1966 March). Teaching Utopia [Electronic version]. The English Journal, Vol. 55, No. 3, 335-337+339. Zablocki, Benjamin. (1980) Alienation and Charisma: A Study of Contemporary American Communes (The Free Press, 1980), ISBN 0-02-935780-2. Wikisource has the text of the 1905 New International Encyclopedia article Communistic Societies. "Roots of Communal Revival" by Timothy Miller. A paper on communes in North America from World War I to the 1960s.